And a happy fall to you! Is it fall yet? I’m not entirely sure. It’s still super muggy out here and coats aren’t needed quite yet. 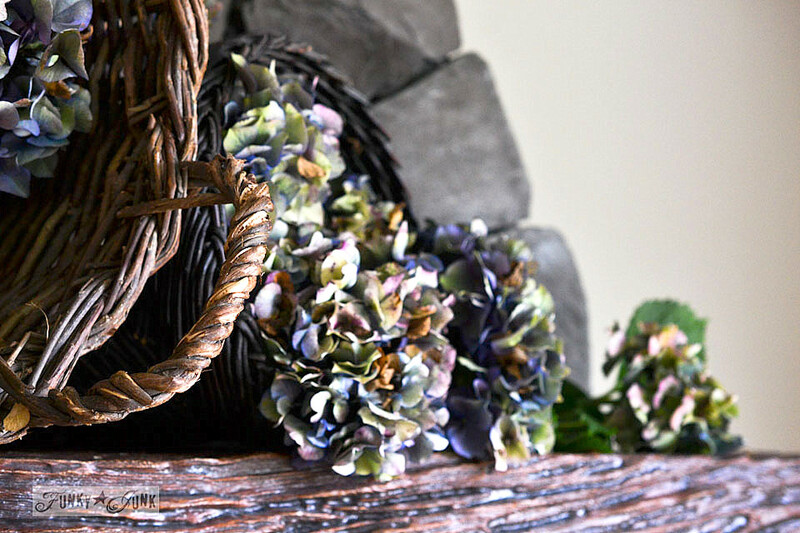 But that hasn’t stopped me from playing around with hydrangea filled baskets for a fall mantel. Oh hello there Skye! Thank you for sitting still for a quick moment! It was harvest time for the hydrangea bush. I like to bring them inside is when the petals turn ever so slightly crispy. 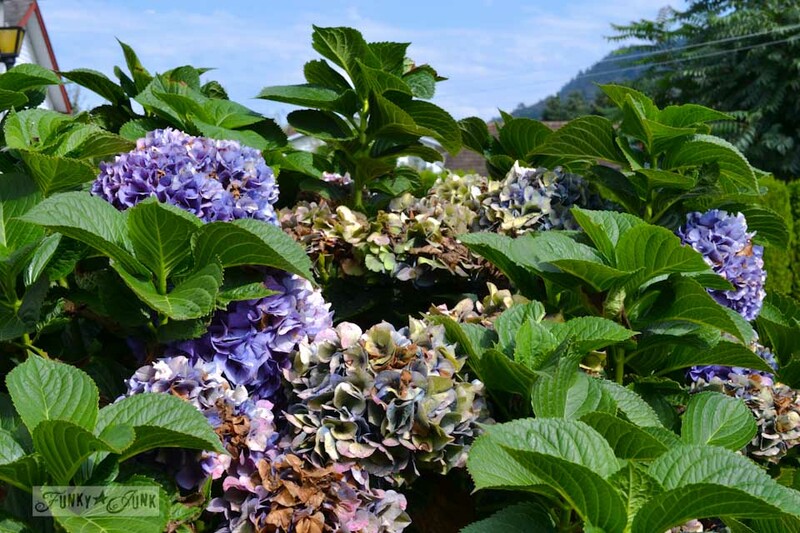 I’ve written about how to dry hydrangeas HERE if you’d like a few more tips. 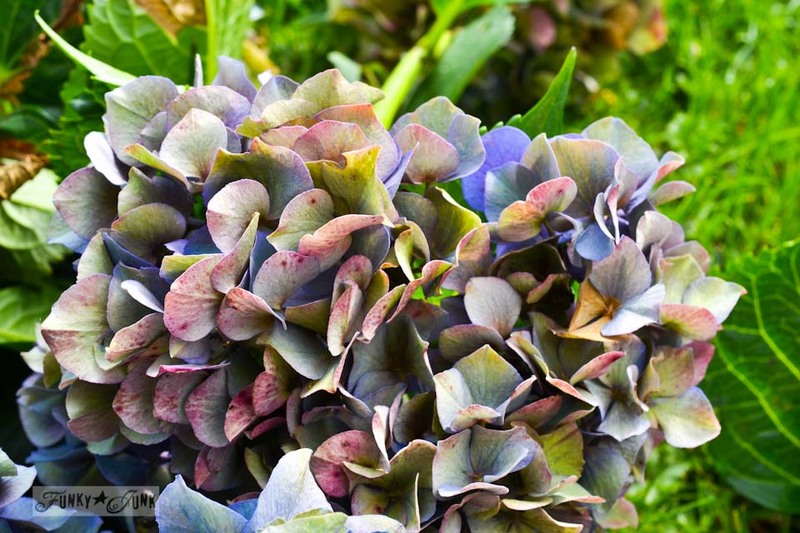 Fall hydrangeas are gorgeous! They turn into a rainbow of colours. This bush was completely blue a short month ago. 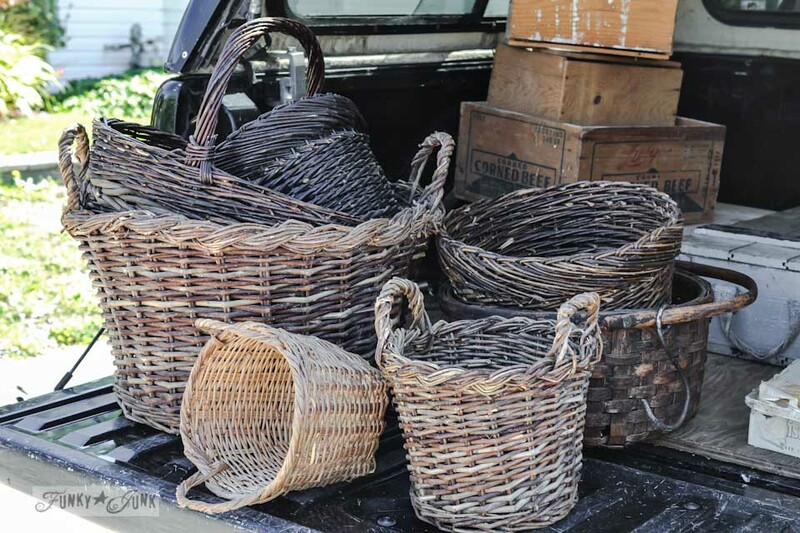 I couldn’t resist putting all those amazing rustic baskets to work from my junker brother’s garage sale! Most decorating inspiration hits when new stuff is brought home… love putting it to work right away. I think that officially gives me free license to shop daily, wouldn’t you say? You know… for the good of the blog? The baskets were positioned in a tumbled over effect. The light plays really neat off the woven textures. 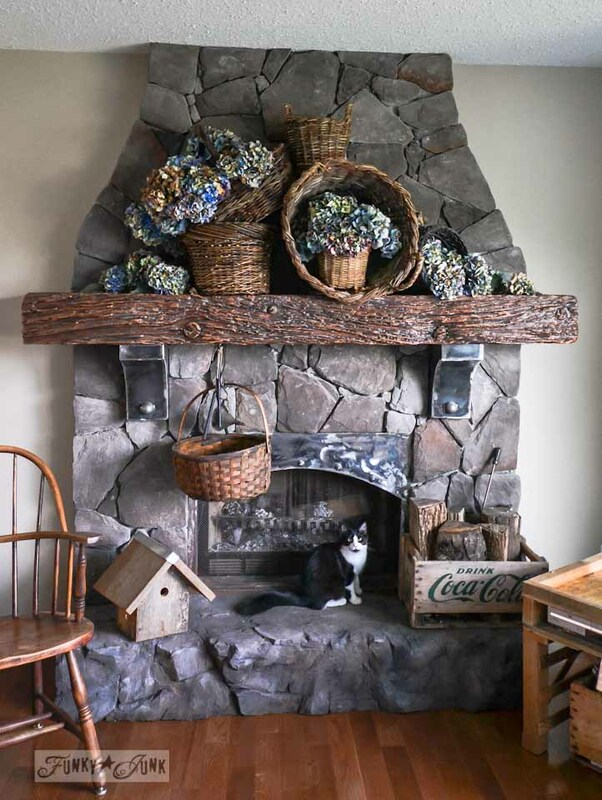 Even though the mantel decorating is pretty subdued, it’s still light enough to be fun and interesting. While they wrestle with… everything, we can just enjoy a quiet moment here. 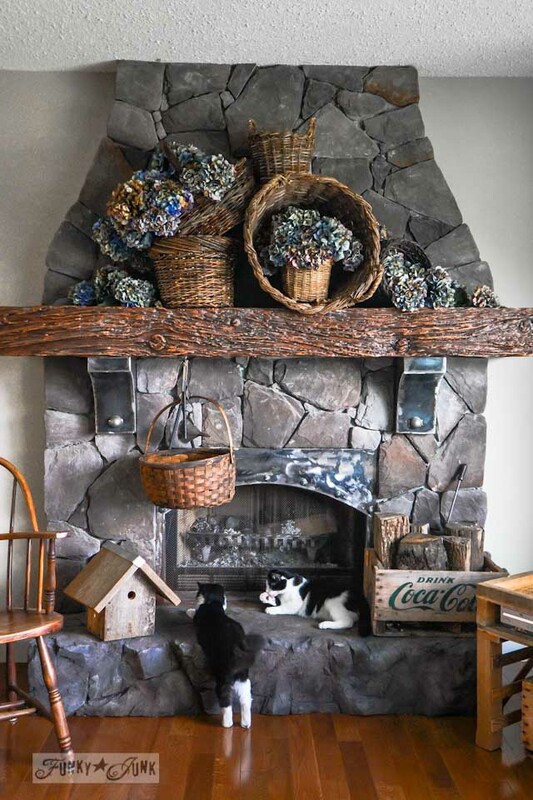 No kitties can get to these hydrangeas quietly nestled on top of a mantel. Gorgeous!!! 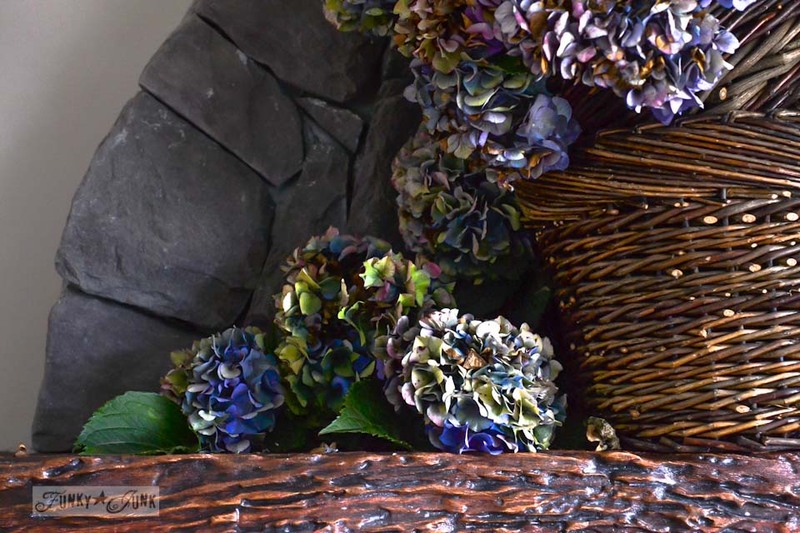 LOVE the baskets/tumbling effect and LOVE the hydrangeas…. and especially LOVE the inclusion of Skye and Lake!! (Don’t count on them not getting to the hydrangeas on the mantel). I need to read your ‘how to dry hydrangeas’ instructions. If I cut mine and put them out for display/decoration, they seem to just turn brown. Tho’ they’re really pretty as they do the turning, once brown they are, of course, too dull. Thanks for the beautiful photos and incentive to start fall decorating. LOve those hydrangeas! and those kitties are handsome too! You have incorporated two of my favorites baskets and hydrangeas on your mantel. I love it. Thanks for constantly inspiring me! Thanks, Donna! Terrific idea for using and displaying baskets! I went back to your older posts on hydrangeas and definitely learned a few new things! 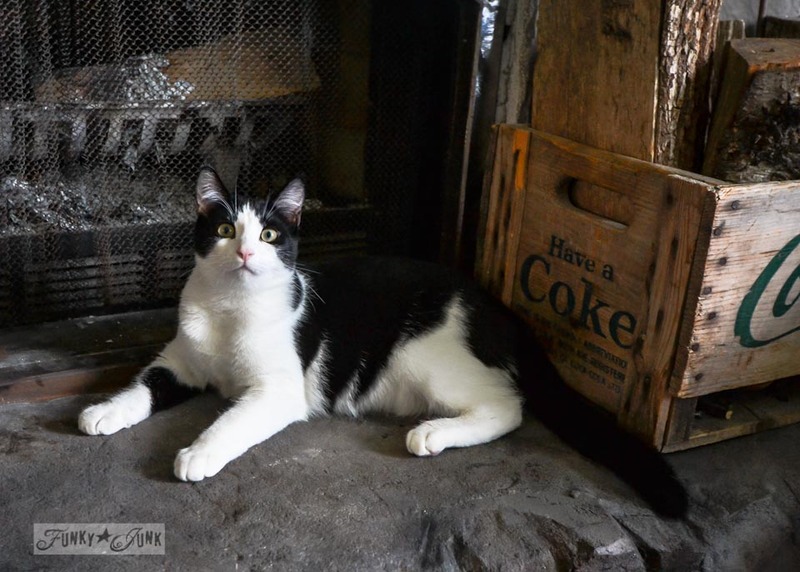 Your little “tuxedo kitties” are too cute! Okay – those are gorgeous! And the flowers aren’t bad either! I think my mother has a whole hedge of hydrangea at her house. . . I may have to go over and get some for a mantel decoration. . . i don’t have a whole bunch of baskets. . . hmmm. . . i’ll think of something! Hydrangeas are my favorite flowers in the world, and what you have done with your mantel is outstanding. Just Beautiful, love them with the baskets. And your two cats are pretty sweet too!! 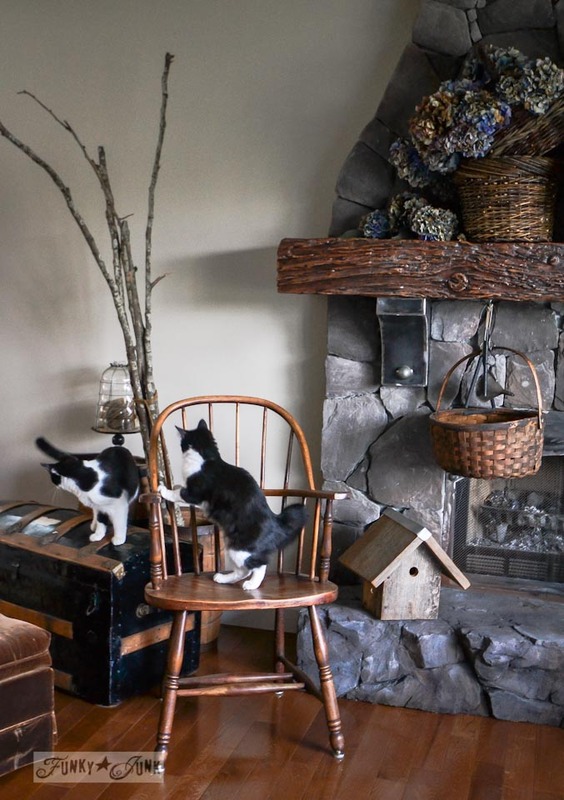 Just LOVE the kitties, mantel, baskets and the Hydrangeas (my favorite flower….along with daisies!! )…..just beautiful! I have two varieties….the pink ones that then go green and a dark mauve (unless I remember to do the acid and then it’s blues and purples) and the white ones that go a soft green to a light brown when drying. They’re wonderful to decorate with! My cats LOVE them and always find a way to get where they are…. sorry but i think they can get up on the mantel but they are so cute. Absolutely beautiful! And I love your use of the baskets! Gorgeous! 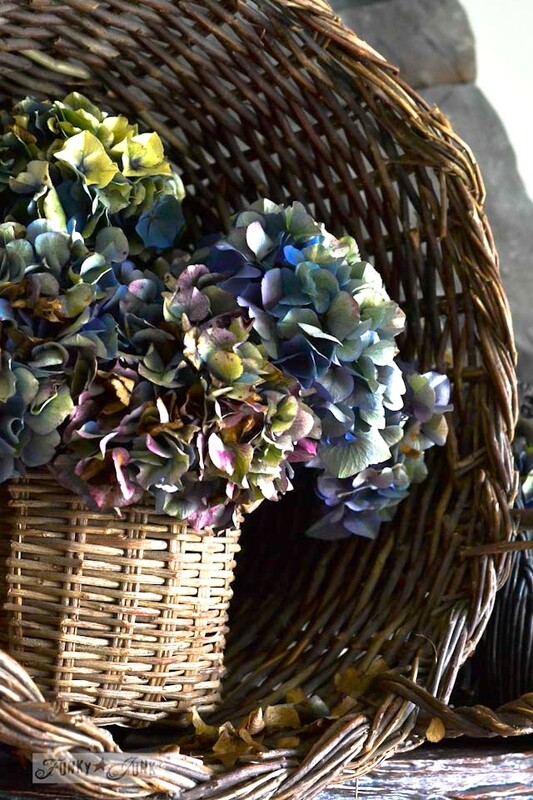 I love hydrangeas and I think they are so much more rustic and romantic when they are dry. So pretty! And I love the baskets too! 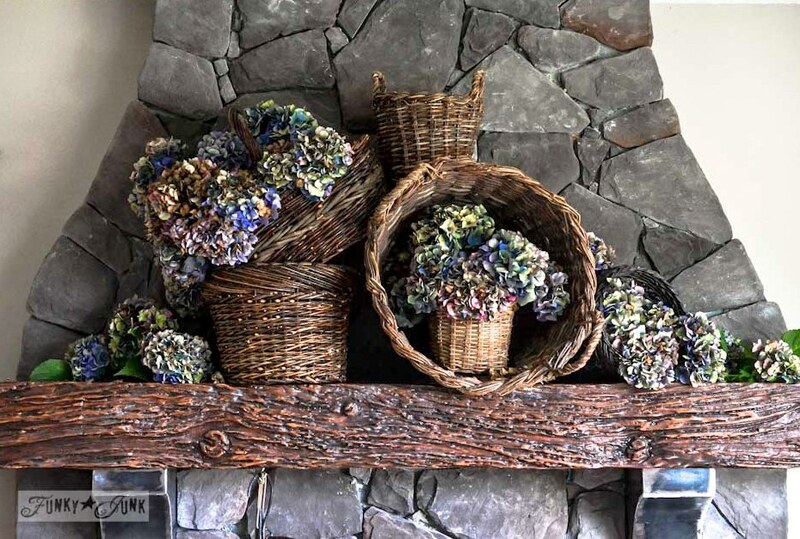 I have filled my old crocks with my dried hydrangeas…your (brother’s) baskets look wonderful! Oh Donna, your mantel is beautiful! 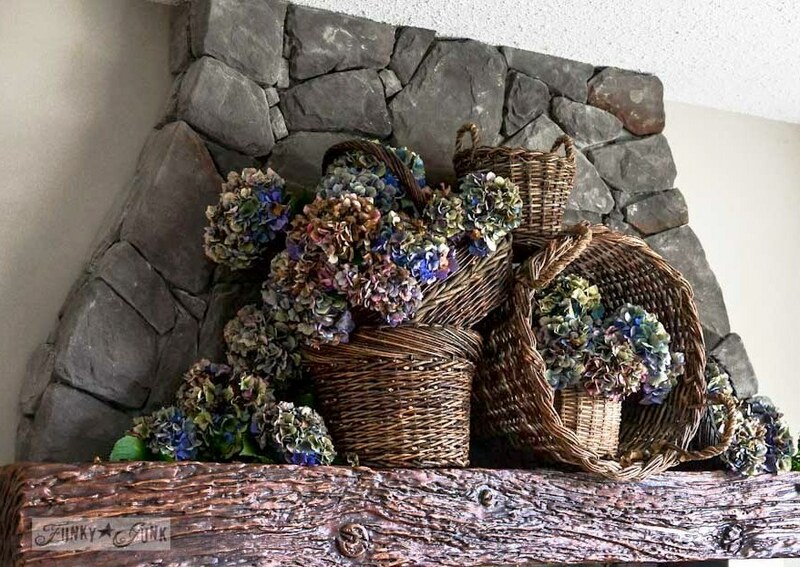 I love the way the hydrangea colors look with the texture of the baskets! I am glad you saved all those great baskets from the garage sale, too. Love your blog, always so inspiring and interesting…..
Hydrangeas are my absolute favorite, think I’ve done like three hydrangea posts this summer already!Great idea putting the baskets on their sides, love the look! Dear inspiration , Please ,Pretty ,please, will you let your brother adopt me. I love old baskets, you fell into a Great look. I cut my neighbors flowers today and can’t stop thinking of yours into those baskets.I’ll have to hit the thrift shops. Thanks for making others drool…Please send me your brothers answer soon! Have a wonderful day. I love it Donna, hydrangeas and baskets, perfect for fall. I love the hydrangeas and the simplicity of your mantle. It’s funny though, that as I write this, I’m actually taking a break from REMOVING two hydrangeas that have got out of control in my yard.